The payroll report wasn’t actually the first. The Treasury Department filed its Treasury International Capital (TIC) update yesterday, about two weeks late due to the federal government shutdown. However, since nobody follows it and the figures relate to a lot that’s beyond the US economy it doesn’t count in the mainstream view. That’s a shame because TIC will tell you so much more about the global economy and the changes taking place within it than the Establishment Survey and unemployment rate could ever hope to. The latest estimates for the month of November 2018 didn’t disappoint, though I suspect we might find even more interesting results when the December numbers are put out. Whenever that might be. To begin with, very few seem to know what the data is actually telling us. 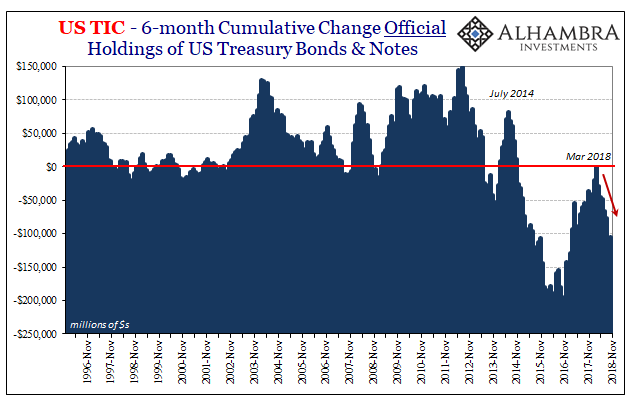 Foreigners are selling their holdings of US government debt (agency paper is heavily represented, too) again, which means, what? Some say it becomes an element in the US-China trade war, others about how especially Russia (who doesn’t have many left) is leading the world to de-dollarize. Most commentary frames it as a choice. It isn’t. Selling US$ reserves is a reaction, and a pretty clear one. Dollar shorts and shortages, that’s all this is. You have to have dollars to participate in global trade.  There is only the one hermit kingdom left on earth, which means that practically every economy that exists today must find dollars somewhere in order to trade (and even North Korea attempts to source them clandestinely). This further proposes a global economy rather than separated systems. Where anyone gets dollars is equally as misunderstood as why anyone is required to find them. The Federal Reserve doesn’t provide a single useful input here. Rather, it is global banks which operate an offshore global currency network who do. Credit-based global currency. This is the eurodollar, even though there is no such thing. Without eurodollar banks supplying a sufficient level of eurodollar resources into these unofficial, offshore spaces the result is a dollar shortage. 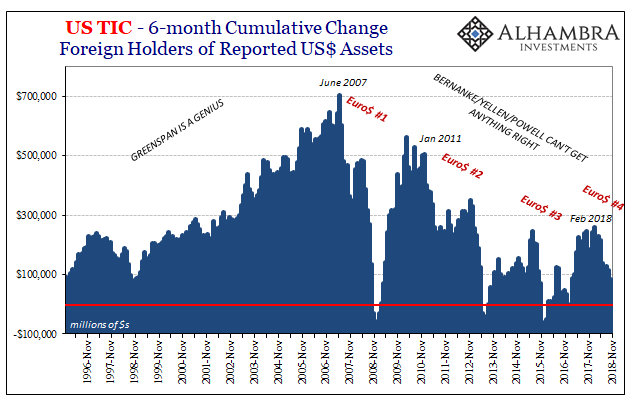 Those countries which have built up foreign reserve stockpiles, China’s is the largest ever conceived, can choose to mobilize those reserves in order to provide local assistance in lieu of the eurodollar market. It isn’t always straightforward nor is it dynamic enough, meaning no perfect or even good substitute for the real thing. Still, it is something. Therefore, when we find various nations (including Russia) “selling UST’s” and other US$ reserves (of all kinds, repos, FX, and maybe even a few innovative transactions that have yet to be uncovered) we know why – dollar shortage because of dysfunction (liquidity preferences) in the eurodollar market. Not only does TIC provide estimates for the US custody of these reserve stockpiles, it also compiles a fair amount of absolutely crucial data on what banks are doing with foreign counterparts (unofficially) in offshore connections. These cross-border dollar transactions pictured here are not comprehensive, meaning they don’t cover the whole broad range of what is really going on out there in the global shadows. Acknowledging those limitations, it is still a decent enough proxy. As you can see above, a clearly renewed dollar shortage following a far weaker reflationary period (this matters, too). Not only that, when the dollar shortage pops up again. 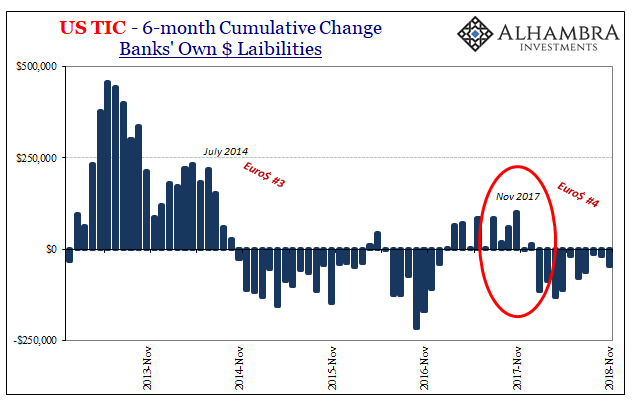 November 2017 the prior Reflation #3 peak, meaning the trouble starts for global banks (liquidity risks) the following month of December 2017. Eurodollars, not populists in Italy. 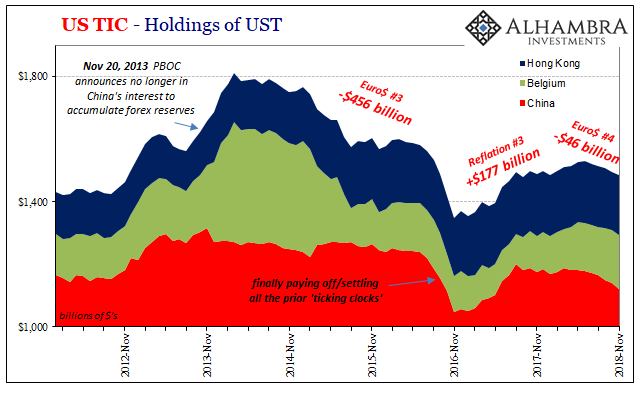 Since the biggest participant is the Chinese, we expect and do find China at the forefront of “selling UST’s.” This is something the PBOC warned the world about if not directly. There are very real costs to reducing and mobilizing reserve stockpiles (which are different depending upon the type of intervention selected). Brazil, for one, refuses to outright sell UST’s preferring instead the elongated suicide process involved with ineffectual swaps. China has done both. When monetary officials “sell UST’s” they at the same time undercut their own domestic money supply (the very scenario Brazil’s monetary officials are trying very hard to avoid). To try and make up the difference, China’s central bank has allowed banks to use more of their own RMB bank reserves (RRR cuts). Now, as in 2015, it isn’t working because Chinese banks are hoarding rather than filling in the RMB gap that necessarily arises out of this dollar shortage. 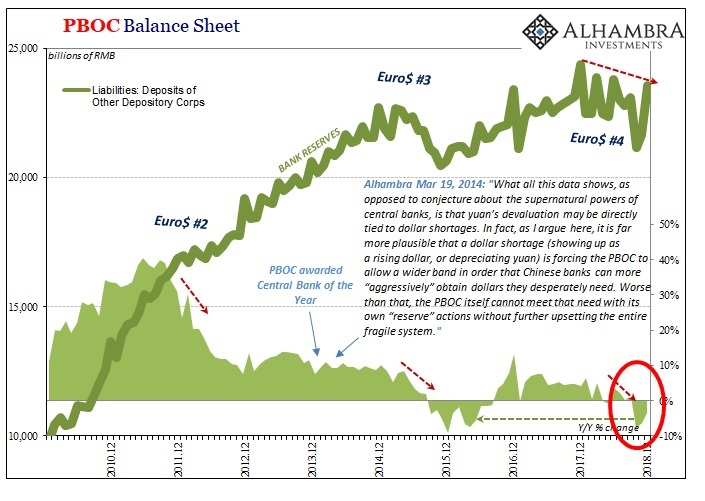 So, any RRR cut announcement is an official acknowledgement of China using reserves meaning eurodollar-based shortage. 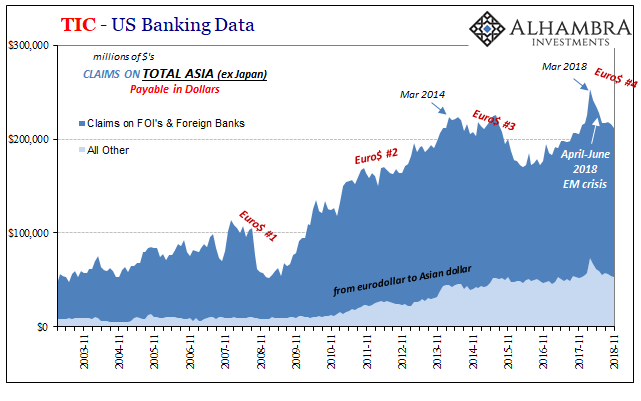 The TIC data perfectly demonstrates the eurodollar part – up to the RMB boundary. China hasn’t been the only one who was provoked by eurodollars, though. 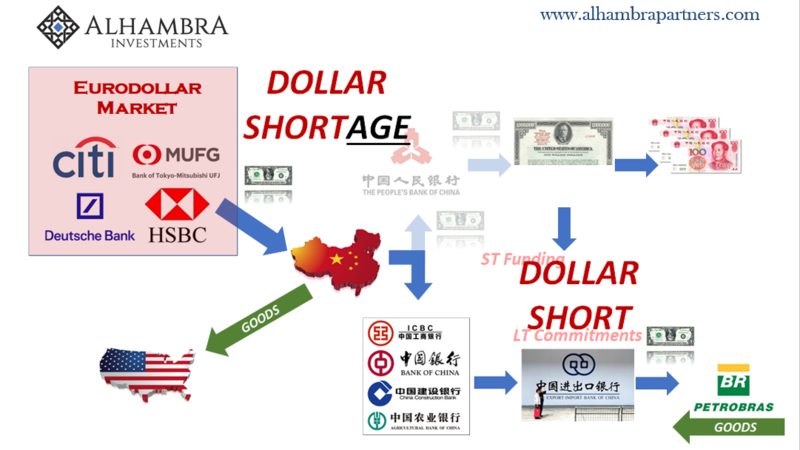 Across all of Asia and emerging markets, there was an obvious dollar shortage that resulted in a number of prominent currency crises. When eurodollars, meaning offshore interbank monetary resources, are hard to come by, local banks have to pay up for the privilege (which is a necessity from their perspective). The dollar rises in exchange value, domestic currencies fall often dramatically. CNY’s decline was the most exaggerated almost certainly because it took place before the PBOC got involved. There were no “selling UST’s” by China until around summertime. These have been ramped up in the latter months of 2018 as CNY has stabilized, but at the cost of increasing internal monetary constraint. Therefore, more RRR’s. In mainland China alone, UST flows amounted to -$4.4 billion in June, -$7.7 billion in July, and -$5.6 billion in August. 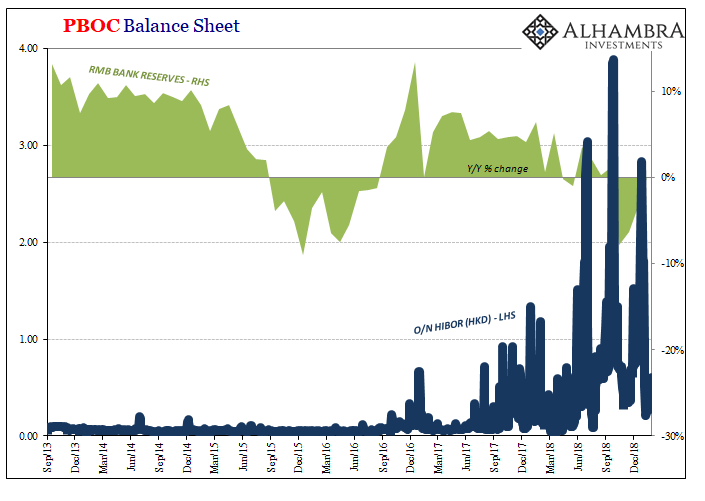 In September, when CNY drew closer to 7.0 to the dollar, intervention was stepped up to -$13.7 billion, -$12.5 billion in October, and finally -$17.5 billion in November as CNY counterintuitively rebounded. The November figures demonstrate the rising tide, the escalating negativity that was built up before December’s market shock. Unlike the payroll reports, the TIC data even though it’s two months behind them gives us a much better, far more accurate sense of things. Like the payroll reports, there isn’t anything here that is unexpected. It’s just a very different story than the one blanketing mainstream commentary. Fed pause because an extremely robust economy can’t stand fed funds @ 240 bps? Yeah, no way. Global downturn forming two Decembers ago as the offshore monetary noose tightened? That’s more like it. The problem, due to Economics, is that no one knows how to read these numbers. That’s not surprising; the discipline refuses to recognize offshore money so it stands to reason Economists therefore those in the media would have so much trouble interpreting what goes into, and comes out of, offshore monetary places. It’s just one of life’s little quirks how the Treasury Department puts this report together in spite of that.